So, if the (first) OT8 included a section to "audit the GE".....was that other's GEs, or one's own GE. If one was to prepare "a body" free of BTs for LRH to "inhabit".....was the idea that one would give up one's own body so Hubbard could take it? Or are all OT8s an "army" of bodies that Hubbard could inhabit and control? Was it Hubbard's idea that he could ultimately get those going up the bridge to give up their bodies...and or weaken them to the point that he could take them over and have many remote viewpoints? Was this a common practice? Was this accepted by the Cult of Scientology that this was going on....and that they were OK with it? George White, the OT8 quoted above, posts at Rinder's blog occasionally. Maybe you can get him to spill the beans there or better, come here and answer your questions. Michael Chan, OT8 drops a few crumbs, but no cake! In the fiscal year 2018, the Walt Disney Company generated a total revenue of 59.43 billion U.S. dollars, up from 55.14 billion in 2017. The Walt Disney Company is a mass media corporation, initially founded in 1923. Scientology Inc has stockpiled 3-5 billion since 1950. The Disney company does 59 billion in ONE YEAR. Screaming that there was a religious *EMERGENCY* the cult put on a Scientology Propaganda Event in Burbank - January 29, 2019. Filmed by Jeffrey Augustine. This was supposed to be an "Emergency Interfaith Press Conference" held at the Redeemer Church in Burbank, California. This church sits across the street from the main gates of the Disney Studios main gate on N. Alameda Street. The event was not a press conference at all. There were no questions and answers and no media present. The event was Scientology complaining about Leah Remini's show -- and yet Leah and her show were never mentioned by name. Scientology sings "It's a Small World" at 19:05. The Disney company did not respond and ignored their silliness. Well, that went down like a lead balloon….. lol. Can't help but think I've heard that expression somewhere else before? I feel sorry for those interfaith people who got roped into a Scientology bitter-ender reunion. There are so many instances where I let myself be made a fool by Scientology. Maybe they think getting these people to participate was a successful op but once again Hubbard's PR policies ultimately result in cringingly bad optics and they will probably lose credibility with these people after they reflect on the moment. Interfaith representatives are almost obligated to be neutral to a fault. If you are part of a Christian interfaith group who is trying to help Christians living in an Islamic country you hope that by being neutral or positive or even facilitate Islam that this will help you gain access and be able to help those people. That is only one example but my sense is that characterizes how you have to think to be part of interfaith activities. They may have serious disagreements but where their interests align they work together. Scientology has a vested interest in preventing legislation that strips their religious cloaking and other religions oppose anything that encroaches on religious freedom. I think it is only natural that OSA would want to capitalize on that kind of obligatory cooperation. Scientology promotes itself as non-denominational. I expect in the interfaith community non-denominational groups are bit players and not very well known. I have to wonder if any of these interfaith people have read A Piece of Blue Sky or watched Going Clear and The Aftermath? Maybe some of them have and those are the members who are not attending. But this looks so bad. The band is paid, the interfaith people almost have to be there, the security and camera crew are probably Scientology staff or vendors, and then the audience is mostly people who have been in tight with OSA for decades. Where are the Scientology public or public from other denominations that would indicate a broad base of support and awareness about the issues? Are they deliberately kept away so they will only see highly edited presentations after the fact? Where are all the young people in the audience? When the ratio of entertainment and support staff is about one to one with the audience that looks weird. Is OSA deliberately trying to show us that it has atrophied into some kind of geriatric club and this was essentially a field trip to get them outside? That it is not only a paper tiger but a paper tiger with dentures? OSA better do whatever it is that they plan to do in the next 5 to 10 years. I love Jeffrey's technique. There is only the most minimalistic zooming and panning. No attempt to add or subtract from the moment, no narration. In acting actors are taught "don't look at the camera". It is a highly developed skill to avert your eyes or blink as your head turns toward the camera. You don't want to draw the viewer's attention to the mechanics behind the scene and distract them from the desired effect. It's like the people in this event were all trained to cooperate with Jeffrey by not looking at him or in his direction. I thought this added to the feeling that his camcorder was like a window in time and space just hovering across the street invisible to people living a moment in history that we can all now see without the distortion of people who would write about it later. Co$ will take anyone they can get their claws into for cash. Denomination: a recognized autonomous branch of the Christian Church. • a group or branch of any religion: Jewish clergy of all denominations. Scientology is non-denominational of course only until they determine that whatever that other denomination is or does violates fundamentalist Scientology KSW "Keeping Scientology Working" doctrine or they can't exploit it for Scientology's benefit. The purpose of Ethics is: TO REMOVE COUNTER-INTENTIONS FROM THE ENVIRONMENT. And having accomplished that the purpose becomes. TO REMOVE OTHER-INTENTIONEDNESS FROM THE ENVIRONMENT. In other words, as long as another denomination is useful in removing counter-intentions to Scientology it conforms with Scientology "Ethics" and can be tolerated to that extent but the clear implication to this senior policy is that once it is no longer useful or needed to remove those counter-intentions, in order to conform to Scientology ethics, it cannot have other intentions. Scientology non-denominationalism is a gradient approach to totalism. Thanks for your comments TheOriginalBigBlue. I'm glad you understood what I wanted to do with minimalism. The actual event was stark, dishonest, and pervaded by a sense of OSA in the backrgound rushing to get it done. Scientology needs an in-house film to show people. There is a full analysis I will post in a few days. Today I interview with David Miscavige's father again, Ron Miscavige. I have added this to my channel for my Tom Cruise playlist. Here is Tom Cruise as spokesman and promoter who is in a continual sales pitch for Scientology. He has always refused to look at both sides of the picture. No matter how many millions of websites and heartbreaking stories describe the darker side of the Scientology Cult, Cruise in his delusion hangs onto his fixed ideas. He is unwilling to inspect, investigate, and evaluate. Mirrored from Lord Savior Xenu. Credit to Lord Savior Xenu Channel. 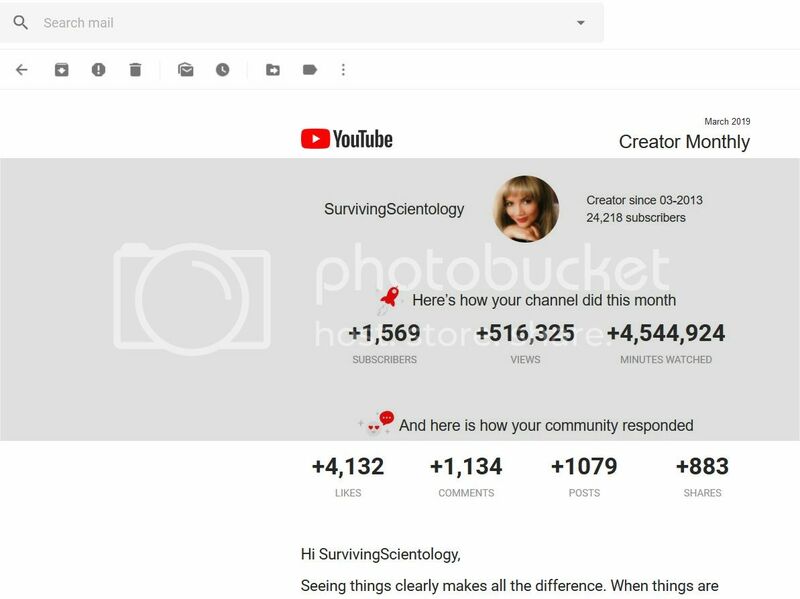 I am sharing an Email from YouTube to me telling me my Stats of the last 30 days. Half a million views of my videos in 30 days is pretty cool. 4.5 million+ minutes of viewers viewing the videos is a good stat. just began to talk about ot8. says he will return soon with more on the level. hope he does. Mike Rinder did a sizzling Interview with Jeffrey Augustine. A long term Santa Barbara Scientologist, (protege of Bob Duggan) OT 5 and Class VI Reed Slatkin's story made a HUGE Splash.He was running a massive Ponzi Scheme and Scientology VIPS and Celebs were the biggest victims. The cult enjoyed his HUGE donations so he got air cover until it all blew up and Reed got indicted and a 14 year prison sentence.Of course the cult quickly distanced themselves declaring him SP and minimizing his 25 year Scientology history. Because there is a present time Scientology high roller who has been accused of running a ponzi scheme called GPB Capital Holdings, Jeffrey tells the tale on Scientology Money Project. We also grabbed the CNBC videos profiling the story the "earlier similar" Reed Slatkin. *American Greed* series. What a hoot ! I thought this was the most ethical group on the planet? I think I'm suffering from a severe case of cognitive dissonance. Mark Bunker, an Emmy award winning videographer gets attacked in Los Angeles while walking on public street because Scn'ists are trained to ATTACK ATTACK ATTACK. These 2 deluded bullies personify the Scientologist who have been indoctrinated and trained to do this when they fear a critic will expose Scientology. This occured a few years ago but is timeless.